In any crisis or critical situation, public figures, who influence millions globally, get caught in a spiral of blame game, which often takes the focus away from showing solidarity with the victims. In the last few hours, streets of Thoothukudi, or Tuticorin, have witnessed bloodshed. The police firing on people protesting against the expansion of the Sterlite Copper plant has been condemned by everyone, except the Prime Minister. The political blame game is on, and everyone has found their favourite enemy in the Tuticorin killings. Almost as a ritual, the ruling government, the AIADMK in this case, has been criticised for mishandling the situation. The state police, too, has come under severe criticism. Congress president Rahul Gandhi, in his tweet, reasoned that Tamils are being killed for not conforming to the RSS ideology. Some on social media, while seething with anger at the killing of 11 people in firing, called it a “General Dyer” moment. It was no surprise that student-activist Shehla Rashid compared the Tuticorin incident to the situation on the streets of Kashmir. Thuglak editor S Gurumurthy, in a series of tweets, seemed to suggest that “outsiders” infiltrated the agitation and questioned the intention behind violating prohibitory orders. Thol. 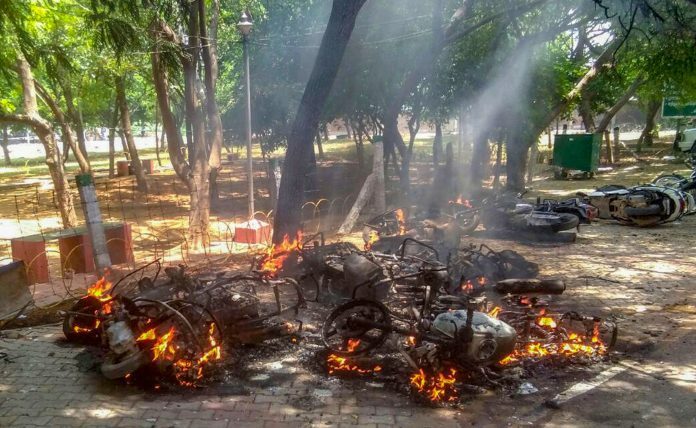 Thirumavalavan, chief of the Viduthalai Chiruthaigal Katchi (VCK), a Dalit party, asked if this incident was different from the Tamil genocide in Sri Lanka. Kamal Haasan, who launched his party a few months ago, criticised the state government at a press meet outside the Thoothukudi Government Hospital. The actor-turned-politician said that those who ordered firing must step down, and the government must initiate peace talks. Rajinikanth, in a video, accused the police of overstepping their authority and slammed the Tamil Nadu government for inaction. Prakash Raj in his #JustAsking campaign attacked the Tamil Nadu state government for being spineless and “dancing” to the Centre’s tunes. Loaded comments comparing the Tuticorin firing to Jallianwala Bagh massacre, or to the streets of Srinagar, or to Tamil genocide don’t seem to be a legit reaction to the incident. What such comments show is that in any crisis or critical situation, public figures, who influence millions globally, get caught in a spiral of blame game, which often takes the focus away from showing solidarity with the victims.